Protect your license plates from scratches, bug stains and dents with the WeatherTech License Plate Frames. This relatively simple-looking product utilizes advanced technology to keep your license plates looking new. It also adds an added dose of style to any car, truck, minivan or SUV. Available in six different frame colors and combinations, it is also available for motorcycle license plates. The WeatherTech ClearCover License Plate Frames are made from Durastar Polymer that is guaranteed not to crack, dull or turn yellow over time. Protects your vehicle license plates from scratches, dents and bug stains. Keeps your license plates clean and looking new. Made from Durastar Polymer that resists cracking and fading, guaranteed not to dull or turn yellow. Available with cover, and comes in six color combinations to match any vehicle color. Buy your WeatherTech License Plate Frames from Sam’s Motorsports. Choose from a wide variety of colors and combinations to suit any type of car. Part Notes: Fits standard motorcycle plate sizes of 4" x 7". Please check your particular license plate for hole spacing. Our frame has a hole centers located at 5.75" x 2.75". 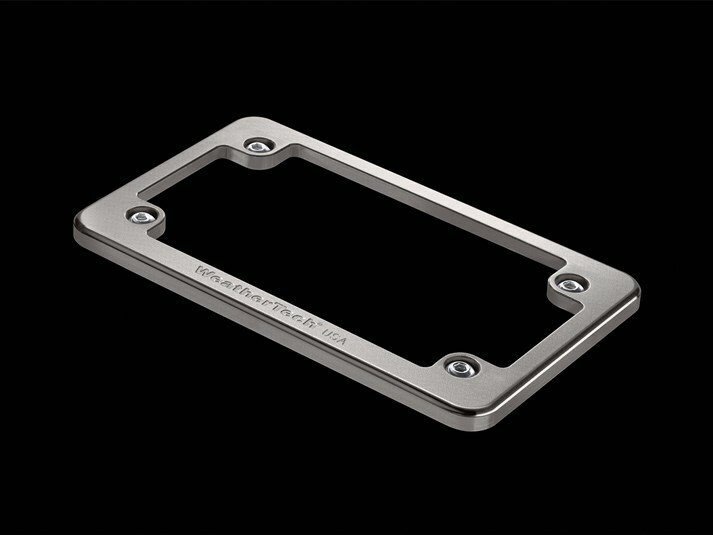 While this WeatherTech License Plate Frames might fit your vehicle, unfortunately we can't guarantee fitment. Please read description and specifications to decide if this part is right for your vehicle.